When we use our gifts to help others, we gain more than we give. Friendship, fun, fellowship, and faith – that is what TLCW is all about. Everyone is welcome. Join us for bible study, sewing projects, in the kitchen, or any of our many activities. You’ll be glad you did. TLCW supports Lutheran World Relief projects around the world to help end poverty, injustice and human suffering. Quilts – Wrapping a quilt around the shoulders of poor, hurting people of the world is like sending a hug and a prayer. The quilting project at Trinity is alive and well. Over 300 quilts per year are sent from Trinity to other countries. Quilts are also distributed locally through Operation Bootstrap and Christmas baskets. Baby Care Kits – A baby care kit is like a promise. It says to that baby, you matter to us and your needs will not be neglected. Kits are distributed as part of emergency and relief efforts around the world. They are also given out as part of health initiatives to encourage women to seek prenatal care. 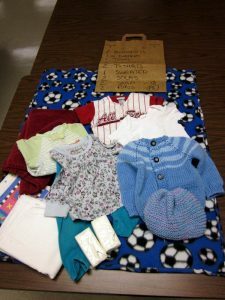 A kit consists of 2 receiving blankets, 2 shirts, 2 sleepers, 4 diapers, 1 hand towel, 2 bars of soap, 2 diaper pins, 2 pairs of socks, 1 hat and 1 sweater. The sweaters are knit by women of the congregation and several times during the year the “Button Brigade” meets to sew buttons on the sweaters. TLCW assembles nearly 200 Baby Care Kits each year. School Kits – Why school supplies? To the children who receive School Kits, these supplies mean the difference between getting an education or not. Public school is usually free, but in the places where LWR works, even a few required supplies, like pens and paper, may be more than many families can afford. And when parents can only afford to send one of their children to school, girls rarely get priority, yet the education level of mothers has the biggest impact on development. A school kit consists of 4 notebooks, 1 scissor, 1 ruler, 1 pencil sharpener, 6 pencils, 6 pens, 1 eraser, 1 box of crayons, and 1 string cloth bag. All items are purchased with TLCW fundraising proceeds or donated by people like you. Over 100 school kits are assembled each year. Personal Care Kits – When LWR distributes Personal Care Kits, it’s often to people who have lost everything. In the wake of an earthquake, or having fled from violence as their homes were overtaken, they clasp a towel from a faraway place, with a bar of soap, a toothbrush…and washing up, they know that they have not been forsaken by the world. The very simple gesture of giving a Personal Care Kit can give someone the encouragement to start anew, starting with a bath. We share God’s grace and love by providing that simple comfort. A kit consist of 1 bath towel, 2 bars of soap, 1 toothbrush, 1 comb, and 1 nail clipper. The Prayer Shawl Ministry is a way to bolster members of the congregation who may need encouragement and/or support. 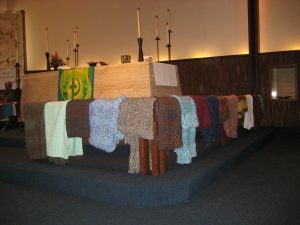 The Prayer Shawls are blessed during a church service and delivered in person with a short visit and note of encouragement. Afghans are made for each of our high school graduates. They are a warm hug from home as they begin their life as an adult, and a reminder that they will always be a part of the Trinity family. Each newly baptized Trinity child receives a sweater and a blanket. These are delivered during a visit from a SPLASH Program representative, a program to support parents of children from birth to 3 years of age. A sweater is also given to each new baby who attends Trinity Learning Center and Pre-School. Each December a Mitten Tree is set up and the congregation is very generous with their donations of mittens, hats and scarves which are then sent to Operation Bootstrap for distribution. During a time of loss Trinity women embrace and support the family and friends of the deceased by providing a free luncheon. This time for nourishment from food and fellowship is greatly appreciated. Rummage sales are the main source of funds used to finance the many projects that are undertaken by TLCW. Four sales are held each year, two in the spring and two in the fall. This is a project the whole congregation participates in, with a seemingly unending supply of items to donate for sale. Thankoffering is an opportunity to give thanks for our many blessings through a monetary contribution. Women of the church participate in the Thankoffering Service as ushers, greeters and worship assistant. Special treats were served during Middle Hour, with donations sent to Women of the ELCA for ongoing and special projects. The women of the congregation provide tasty treats for Sunday Morning “Middle Hour” – a time for coffee and fellowship between the two worship services. The proceeds from donations received support TLCW projects. The women of Trinity truly show their faith in action. They also nourish their faith through the fellowship and Bible Studies of their Circles. All women are welcome and encouraged to join a circle.